In today's global economy, a food product or its ingredients may be sourced from a single farm or from producers and manufacturers worldwide. Truth-in-labelling regulations exist to verify the authenticity and origins of these products as they are exported around the globe. However, recurring food contamination scandals show that there is always room for error, if not intentional adulteration or counterfeiting. Our scientists are constantly developing technologies for testing the authenticity of foods and feeds to protect consumer interests and public health. Want to learn more about which application will meet your requirements? 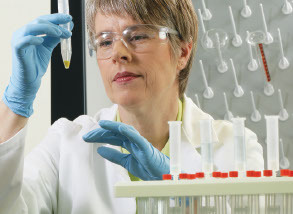 Our Thermo Scientific molecular spectroscopy solutions deliver a full spectrum of analytical tools that help you make critical decisions with confidence. Our innovative, high performance instruments and user-friendly software lead you to the definitive answers you are looking for, be it on the production floor or in research and analytical services laboratories. Bring the accuracy and reliability of a lab-proven technology directly to the scene. Thermo Scientific handheld Raman analyzers provide clear, definitive results in the field for instant identification of counterfeit and hazardous materials. Improve product quality and manufacturing efficiency from the lab to the production line. Thermo Scientific NIR and FT-NIR analyzers set the standard for process and quality control analytics through intuitive operation and unique combination of performance, power, and support. The GMO testing portfolio contains solutions for your complete workflow for detecting the presence of GMO-specific DNA sequences in soy, corn, and downstream processed products, including a universal assay that detects and quantifies all approved GMOs in Europe and most of the GMOs approved elsewhere. Our portfolio of real-time animal species PCR-testing solutions includes high-sensitivity assay kits for beef, poultry, ruminant, equine and pork DNA in food and feed products. Isotope ratio mass spectrometry is an increasingly important tool in determining food authenticity. For example, variations in the distribution of hydrogen and oxygen isotopes or of carbon and nitrogen isotopes may be used to establish the geographical origins of agricultural products. Liquid chromatography- and gas chromatography-mass spectrometry (LC-MS and GC-MS) are used in the targeted analysis of pre-defined food components or to screen for adulterants and additives to check food labeling claims. Isotopic analyses of foods have become a widespread tool to evaluate the quality, authenticity and origin of food products. See how IRMS technology is improving food quality.